Viruses are small parasites that can only replicate inside the living cells of hosts. A virus is typically composed of enzymes that are protected in a coat of lipids and proteins. It also includes the information which encodes the viral proteins, the viral genetic material (it can be either an RNA or DNA molecule(s)). The viral genetic material includes all the information necessary for its replication in the host. Specifically, it includes two groups of genes: early genes which are used to generate proteins immediately following entry into the host cell, but prior to its replication. The expression of early genes initiates replication of the genome, and the expression of the second group of genes, the late genes. Today there are thousands of known viruses that infect hosts from all the domains of life (including fungi, plants, bacteria, mammals, archaea, etc), and they comprise over 94% of the nucleic-acid-containing particles in the oceans. Viruses are responsible for various human diseases (e.g. common cold, influenza, chickenpox, and Ebola, AIDS). They play a central role in evolution via the transfer of genetic material between different hosts/organisms. Viruses also have various biotechnological applications: for example, they can be used for introducing genetic material into cells, or as building blocks (nano-particles) for materials and devices. Evolution shapes the viral genome for its efficient replication and transmission among hosts. Thus, viruses include various codes that enable them to exploit various intra-cellular resources of the host for efficient synthesis of the viral proteins and replication of its genetic material. Since viral genomes tend to be very compact, for efficient replication, they tend to include high concentrations of various types of regulatory information/codes encoded in the same genomic regions. 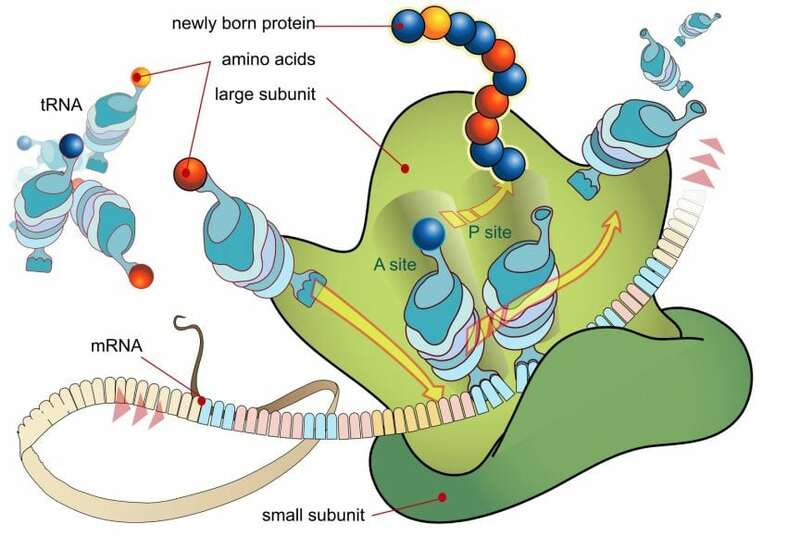 mRNA translation is the process by which information encoded in the genetic material (with nucleotide molecules as the alphabet) is decoded and translated by the ribosome to proteins (with amino acid molecules as the alphabet); during this process each triplet of nucleotides, which is named a codon, is translated to an amino acid. Since different intracellular factors are needed to translate different codons, the time the ribosome spends on translating different codons is not uniform: there are faster more efficient codons, and there are slower less efficient codons. Since the concentrations of the intracellular factors may change in different conditions/states of the cell, the codon decoding times are also not constant but are condition specific. One common mechanism to all viruses is the fact that they all must use the ribosomes of their host to synthesize the viral proteins. Thus, mRNA translation of the viral genes is usually strongly affected by the intracellular conditions in the host cell. The aim of a recent research performed at Prof. Tuller’s lab was to better understand the way the efficiency of translation is encoded in the genome of the virus bacteriophage lambda: A central challenge related to this topic is the fact that today there are no tools that enable measuring the decoding times of different codons in vivo. A recent experimental approach named ribosome profiling was suggested several years ago, which enables estimating the density of ribosomes over the genetic material. Novel algorithms developed at the Tuller lab and implemented on these data enabled the estimation of the decoding rates of different codons in vivo. These approaches were specifically implemented in this study to estimate the decoding times of different codons in different developmental stages of the bacteriophage (between 0 to 20 minutes after the beginning of the lytic phase which is the viral reproduction cycle). The results demonstrated that indeed the decoding rates of codons in the host cell vary during the developmental stages of the bacteriophage. At the next step, to better understand the evolution of the bacteriophage, an analysis of the bacteriophage genes based on these estimations was performed. This analysis demonstrated that evolution shapes the bacteriophage lambda in various ways that ensure the optimality of the viral life cycle via fitting the codons in the bacteriophage genes to the intracellular environment in the host cell. Specifically, it was found that the early and late genes of the bacteriophage tend to have different compositions of codons. The codons of the early genes tend to be fitted to the concentrations of translation factors of the host cell at the early stages of viral development, while the codons of the late genes tend to be fitted to the concentrations of translation factors of the host cell at the late stages of viral development. This means that evolutionary selection introduces mutations in the early and late genes respectively such that they will tend to include codons with faster decoding rates at the time when they are translated: the early genes include codons that are faster at the early stage of the development, and the late genes include codons that are faster at the late stage of the development. The study demonstrates that translation efficiency is more important for the bacteriophage lambda fitness than was previously thought. A follow-up study suggested that similar patterns appear in additional bacteriophages and also in human viruses such HIV. These results provide new insights regarding the way regulatory information is encoded in the viral genomes and may teach us new approaches for developing viral vaccines and therapies, and additional biotechnological viral based products. Specifically, in many cases by optimizing/de-optimizing the codons of a viral gene based on the intracellular environment when it is mostly expressed we can increase/decrease the replication rate of the virus and the expression levels of its genes. This research was performed by Prof. Tuller and his students Mr. Goz, Mrs. Mioduser, and Mr. Diament, with a recently published study on the topic: Evidence of translation efficiency adaptation of the coding regions of the bacteriophage lambda that was published the journal DNA Research.